THEY started out as 10 strangers but, after their amazing adventure, they now share a lifelong bond as 10 great friends. Celtic supporters Frank Gilhooley, Derek Noonan, George McCluskey, Derek McDaid, Michael McDonald, Seamus Brown, Edward Molloy, David Brown, John-Paul Leonard and Kevin McCormick, collectively known as The Wander Bhoys, have recently returned from their Kilimanjaro Challenge. 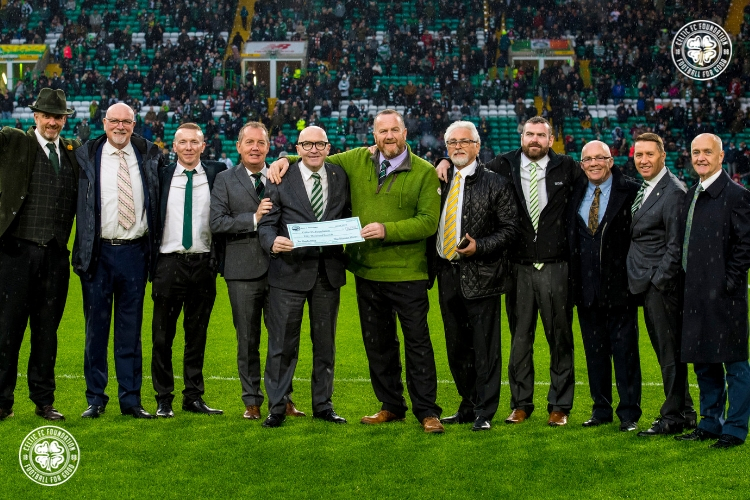 The group were in attendance for Saturday’s SPFL clash with Livingston and were invited out on to the Paradise pitch at half-time, to hand over a cheque to Celtic FC Foundation Chief Executive, Tony Hamilton, for an incredible £50,000. The Wander Bhoys began their journey on February 28 but were met with a frustrating start, as flight delays halted their progress. An unexpected overnight night stay in Amsterdam meant that the group actually lost their first planned day in Tanzania. Despite this, their spirits continued to be high as they finally got under way, on a six-day ascent up the mountain. Following their outstanding efforts, the group reached the summit, where each of them donned their Hoops, turning Kilimanjaro green and white. Speaking of the challenge and the group’s achievements, Frank Gilhooly said: “From a simple discussion with my wife two years ago, to physically standing at the top of Kilimanjaro last month with a great bunch of Celtic supporters, it has been an amazing journey. Celtic FC Foundation Chief Executive, Tony Hamilton, was overwhelmed by the donation and said: “We’re always blown away by the efforts people make for Celtic FC Foundation. On this one, credit to Frank Gilhooley who worked very hard to get this up and running. It took a real effort and fair play to him for getting the group together and working hard on the logistics. “And a massive thanks to all 10 of them for undertaking such a monumental challenge in conquering Kilimanjaro. I can only imagine that it was a very tough mental challenge, as well as a hugely physical one, and we couldn’t be prouder of all 10 of them."